Swakopmund (German for "Mouth of the Swakop") is a city on the coast of western Namibia, 352 km (219 mi) west of the Namibian capital Windhoek via the B2 main road. It is the capital of the Erongo administrative district. The town has 44,725 inhabitants and covers 193 square kilometres (75 sq mi) of land. The city is situated in the Namib Desert and is the fourth largest population centre in Namibia. Swakopmund is a beach resort and an example of German colonial architecture. It was founded in 1892 as the main harbour for German South West Africa, and a small part of its population is still German-speaking today. Buildings in the city include the Altes Gefängnis prison, designed by Heinrich Bause in 1909. The Woermannhaus, built in 1906 with a prominent tower, is now a public library. Attractions in Swakopmund include a Swakopmund Museum, the National Marine Aquarium, a crystal gallery and spectacular sand dunes near Langstrand south of the Swakop River. Outside of the city, the Rossmund Desert Golf Course is one of only five all-grass desert golf courses in the world. Nearby is a farm that offers camel rides to tourists and the Martin Luther steam locomotive, dating from 1896 and abandoned in the desert. Swakopmund lies on the B2 road and the Trans-Namib Railway from Windhoek to Walvis Bay. It is served by Swakopmund Airport and Swakopmund Railway Station. The Herero called the place Otjozondjii. The name of the town is derived from the Nama word Tsoakhaub ("excrement opening") describing the Swakop River in flood carrying items in its riverbed, including dead animals, into the Atlantic Ocean. However, Prof. Peter Raper, Honorary Professor: Linguistics, at the University of the Free State points out that the name for Swakopmund is based on the San language, namely from “xwaka” (rhinoceros) and “ob” (river). The German settlers changed it to Swachaub, and when in 1896 the district was officially proclaimed, the version Swakopmund (German: Mouth of the Swakop) was introduced. 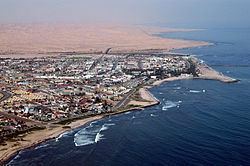 Captain Curt von François founded Swakopmund in 1892 as the main harbour for the Imperial German colony—The deep sea harbour at Walvis Bay belonged to the British. The founding date was on August 8 when the crew of gunboat Hyäne erected two beacons on the shore. Swakopmund was chosen for its availability of fresh water, and because other sites further north such as Cape Cross were found unsuitable. The site did, however, not offer any natural protection to ships lying off the coast, a geographical feature not often found along Namibia's coast. When the first 120 Schutztruppe soldiers and 40 settlers were offloaded at Swakopmund, they had to dig caves into the sand for shelter. The offloading was done by Kru tribesmen from Liberia who used special boats. Woermann-Linie, the operator of the shipping route to Germany, employed 600 Kru at that time. Swakopmund quickly became the main port for imports and exports for the whole territory, and was one of six towns which received municipal status in 1909. Many government offices for German South West Africa had offices in Swakopmund. During the Herero Wars a concentration camp for Herero people was operated in town. Inmates were forced into slave labour; approximately 2,000 Herero died. Soon, the harbour created by the "Mole" (breakwater) silted up, and in 1905 work was started on a wooden jetty, but in the long run this was inadequate. In 1914 construction of a steel jetty was therefore commenced, the remains of which can still be seen today. After the First World War it became a pedestrian walkway. It was declared structurally unsound and was closed to the public for seven years, and in 2006 renovations to the portion supported by concrete pillars were completed, with a seafood restaurant and sushi bar being added to the end portion of the steel portion of the jetty soon after. A new timber walkway was also added onto the existing steel structure, and the steel portion of the jetty reopened to the public in late 2010. Trading and shipping companies founded branches in Swakopmund. A number of these buildings still exist today. After German South West Africa was taken over by the Union of South Africa in 1915, all harbour activities were transferred from Swakopmund to Walvis Bay. Many central government services ceased. Businesses closed down, the number of inhabitants diminished, and the town became less prosperous. However, the natural potential of Swakopmund as a holiday resort was recognised, and this potential has subsequently been developed. Today tourism-related services form an important part of the town's economy. After Namibian independence from South Africa in 1990 many street names were changed from their original German, or in some cases, Afrikaans names, to honour Namibians, predominantly Namibians of black heritage. For example, in 2001, then-president of Namibia Sam Nujoma renamed the main street (Kaiser-Wilhelm-Straße) Sam Nujoma Avenue in honour of himself. Swakopmund is governed by a municipal council that currently has ten seats. The 2015 local authority election was won by the SWAPO party which gained six seats (5,534 votes). One seat each was won by the United Democratic Front (UDF, 1,168 votes), the local Swakopmund Residents Association (SRA, 790 votes), the Democratic Turnhalle Alliance (DTA, 497 votes), and the National Unity Democratic Organisation (NUDO, 296 votes). The Democratic Resettlement Community is an informal settlement in Swakopmund. It was founded in 2001 as temporary housing for people waiting for subsidized housing in the city. Most inhabitants of the town live in the suburbs of Vineta, Tamariskia, Mondesa and Vogelstrand. Both black and white people, mostly well-to-do, live in Vineta. Tamariskia was originally a neighbourhood for the coloured people, built in the early 1970s, to replace the shacks the coloureds earlier had between the town centre and Vineta. Mondesa existed already in the 1960s, and it was a neighbourhood for the black people, and it was a considerable distance from the town centre in the early days. The discovery of uranium at Rössing, 70 km (43 mi) outside the town, led to the development of the world's largest opencast uranium mine. This had an enormous impact on all facets of life in Swakopmund which necessitated expansion of the infrastructure of the town to make it into one of the most modern in Namibia. The city has scattered coffee shops, night clubs, bars and hotels. There are balloon rides, skydiving, quad biking, as well as small marine cruises. The Swakopmund Skydiving Club has operated from Swakopmund Airport since its founding in 1972. In August 2008, filming commenced in Swakopmund on the AMC television series The Prisoner starring Jim Caviezel and Sir Ian McKellen. Swakopmund was used as the film location for The Village. In May 2015, Hollywood production company Village Roadshow Pictures, featuring Charlize Theron and Tom Hardy commenced filming of Mad Max Fury Road in-and-around Swakopmund and the surrounding desert landscapes. In October 2000, an agreement was signed between the Namibian and People's Republic of China governments to build a satellite tracking station at Swakopmund. Construction was completed in July 2001 at a site north of Swakopmund to the east of the Henties Bay-Swakopmund road and opposite the Swakopmund Salt Works. The site was chosen as it was on the orbital track of a manned spacecraft during its re-entry phase. Costing N$12 million, the complex covers 150m by 85m. It is equipped with five metre and nine metre satellite dishes. The main healthcare provider in the city is the Cottage Medi-Clinic, a hospital with 70 beds. Surrounded by the Namib Desert on three sides and the cold Atlantic waters to the west, Swakopmund enjoys a mild desert climate (BWn, according to the Köppen climate classification). The average temperature ranges between 15 °C (59 °F) to 25 °C (77 °F). Rainfall is less than 20 mm per year, making gutters and drainpipes on buildings a rarity. The cold Benguela current supplies moisture for the area in the form of fog that can reach as deep as 140 km (87 mi) inland. Fogs that originate offshore from the collision of the cold Benguela Current and warm air from the Hadley Cell create a fog belt that frequently envelops parts of the Namib desert. Coastal regions can experience more than 180 days of thick fog a year. While this has proved a major hazard to ships—more than one thousand wrecks litter the Skeleton Coast—it is a vital source of moisture for desert life. The fauna and flora of the area have adapted to this phenomenon and now rely upon the fog as a source of moisture. The German school Regierungsschule Swakopmund was previously located in the city.